National team manager Akira Nishino named his 23-man squad for next month’s World Cup in Russia on Thursday and targeted at least a draw from each of Japan’s first-round games against Colombia, Senegal and Poland. “My biggest goal is for us to play in a way that befits the Japan national team,” said Nishino, whose first game in charge after replacing fired predecessor Vahid Halilhodzic in April ended in a 2-0 defeat to Ghana in Yokohama on Wednesday night. Nishino dropped three players from the 26-man squad that faced Ghana — Kashima Antlers midfielder Kento Misao, Stuttgart striker Takuma Asano and Cultural Leonesa midfielder Yosuke Ideguchi. Asano and Ideguchi scored the goals that clinched Japan’s place at the June 14-July 15 World Cup in a 2-0 win over Australia last August, but both paid the price for failing to pick up game time with their club teams this year. Nishino’s squad includes star names Keisuke Honda, Shinji Kagawa and Shinji Okazaki — all of whom were in danger of missing out under Halilhodzic. Seven of the 23 players have made over 80 international appearances, and 11 were in the squad for the 2014 World Cup in Brazil, where Japan exited in the first round. “I haven’t only chosen players with experience who have achieved things in their careers,” said Nishino. “I have picked young players as well. The veteran players will be a good influence on the young players and that will benefit the team. 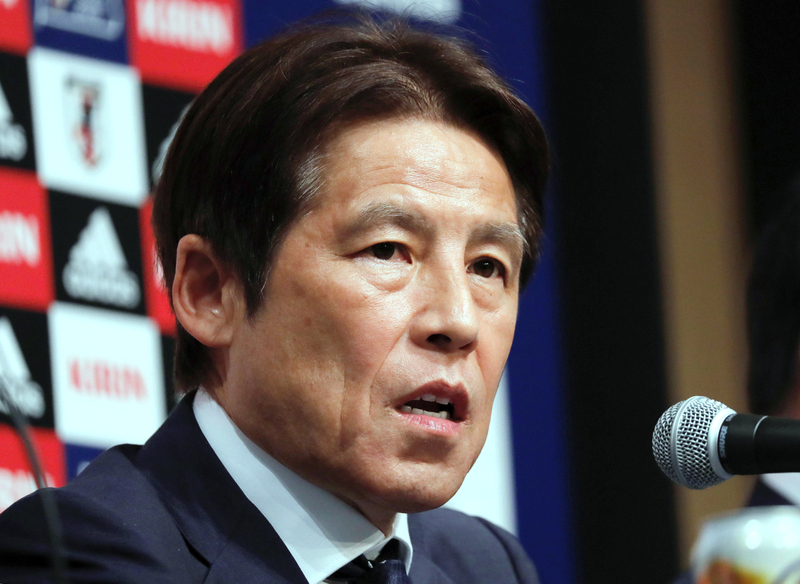 Japan begins its World Cup campaign against Colombia in Saransk on June 19 before facing Senegal in Yekaterinburg on June 24 and Poland in Volgograd on June 28. The team will also play friendly matches against Switzerland and Paraguay in Europe before the World Cup begins. 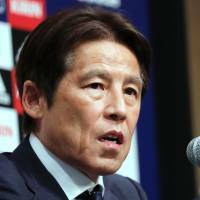 Nishino will be hoping for a better performance than Wednesday’s uninspiring defeat to Ghana, however, which saw Japan concede a goal from a free kick after nine minutes and a penalty in the 51st minute. “The players were determined to win,” said Nishino. “They have a new manager and a new playing system, and they put in a lot of effort to make it work even though we didn’t have a great deal of time. The most frustrating thing is that we didn’t score any goals. Nishino made his name as manager of Japan’s team for the 1996 Atlanta Olympics, where he oversaw a famous 1-0 win over Brazil that became known as the “Miracle of Miami.” The 63-year-old was called in to replace Halilhodzic in early April when the Japan Football Association fired the Bosnian, citing a “breakdown in trust and communication” with the players.